Quartz glass qualities used for optics consist of high-purity synthetically produced molten quartz. This type of glass is also known as Fused-Silica. The amorphous silicon dioxide material contains practically only silicon and oxygen and is characterized by very high purity. Only such grades of quartz glass materials offer such a great UV-transmittance of more than 80% already at 185 nm. This high UV transparency can hardly be achieved with any other glass. Also unprecedented is the enormous operating temperature range and the thermal strength of quartz glass. It can be operated permanently at temperatures of 1000 °C and is very resistant to temperature changes. These exceptional thermal properties result from the low coefficient of thermal expansion of quartz glass. The unique chemical properties of this material are remarkable too. Quartz glass is exceptionally resistant to salt solutions, acids, and water. The chemical resistance to bases surpasses almost all other glass types. Additionally, quartz glass has particularly good electrical properties due to its high purity. Since electrical currents can only flow through moving ionic impurities, which are marginal in quartz glass, it has a very low conductivity and therefore offers a very high insulation resistance, which is an essential requirement for many semiconductor and electronic applications. We produce quartz glass optics mainly from quartz blocks, the so-called boules. If required, the raw glass can be selected and specified for extremely low inclusions and bubbles. The index homogeneity of this type of quartz glass can be selected down to ≤ 0,5 ppm. To produce an optic from a glass boule, we first saw the raw material from the block, bring it into the desired shape and then grind and polish it according to the required specification. In this way, our company produces windows, substrates, wafers, microscope slides, laser components, and other quartz glass optics on a daily basis. In addition to the optics grades of quartz glass described above, we also process less sophisticated quartz glass qualities for applications that only require sight glass performance. Since the inner material quality and DUV transparency are of secondary importance for such applications, the more economical natural fused quartz glass can usually be chosen for the manufacturing of such components. Unlike Fused Silica, these glass qualities are made by melting natural quartz instead of high purity synthetic quartz. Therefore, these materials cannot offer such a high internal glass purity and homogeneity as Fused Silica. 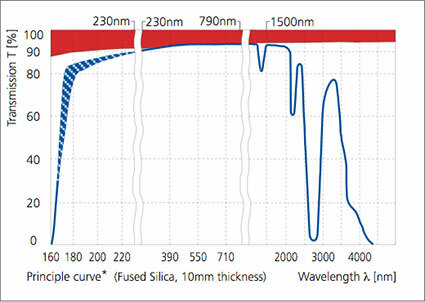 Those types of materials are therefore less suitable for demanding optical applications. However, as they offer a similarly high thermal strength and are significantly more economical than the high-end glasses described before, such material qualities are typically used for high-temperature sight glasses, lamp housings, UV lighting applications, furnace windows, and similar components. You can find further information and properties of these glass types in our data sheet for fused quartz. We also offer production of our UV-grade quartz glass as part of our 48 h Express-Service. The possible thicknesses within the express service are listed below. All these materials have double side polished surfaces. You can open a price inquiry form by clicking on the desired glass thickness below. Please select the "Express" option in the request form if you would like to use this service for an additional charge. 0,30 mm ; 0,50 mm ; 1,00 mm; 2,00 mm and 3,00 mm. Our company processes the raw materials of all leading companies in the quartz glass industry (Corning, Heraeus, Tosoh, SCHOTT, Saint Gobain, GE, and others). Please feel free to inquire about detailed specifications and properties of all Fused Silica and fused quartz glass qualities we process. All given details and specifications are mean reference values and are not guaranteed. Also, please consider the "Notes on technical specifications".